Have bond investors really gone mad this time? Just recently, the following graph hit my Twitter timeline (courtesy @TihoBrkan). It shows that the yield on Eurozone high yield bonds is now equal to the yield on the 10-year US Treasury. This raises the question if bond investors have lost it. On the face of it one might say ‘yes.’ Why would you invest in debt of risky companies, at least a few of them are likely to go bankrupt, without any additional compensation compared to lending your money to the US Treasury. A couple of nuances should be taken into account, however. First, as default risk is obviously higher in the case of high yield bonds, even though the probability of a US default is certainly not zero, duration risk is not. 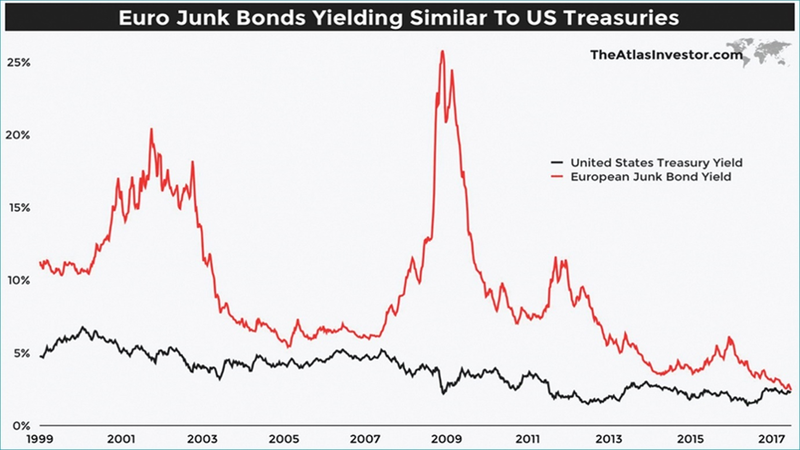 Currently, the duration risk of US Treasuries is more than twice that of Eurozone high yield bonds. Hence, when interest rates rise, which I expect, the price of US Treasuries will fall twice as much, ceteris paribus. Second, the comparison with 10-year US Treasuries is not relevant for most Eurozone high yield bond investors. More important is the interest rate spread that is ‘earned’ on top of Eurozone government bonds, specifically the German 10-year government bond, the ultimate benchmark of all European bonds. The spread of Eurozone high yield bonds compared to the 10-year German government bond yield is shown in the graph below. Surely, this spread has been higher in then past, but spread-wise, current market circumstances are far less extreme than in the chart above. In fact, between 2005 and 2006 the spread on Eurozone high yield was even tighter than today. It’s the historically large gap between German (0.43%) and US (+2.26%) 10-year bond yields that offers the most important explanation for why the yield on Eurozone high yield bonds and US Treasuries have converged. Is the current low level of high yield bonds spread justified? I’m inclined to say it is. The Eurozone economy is growing at the fastest pace in six years and company earnings, including those of high yield companies, are growing fast. In addition, central bank liquidity remains abundant for now. This reduces the chance of default. The chart below shows that the number of defaults in the Eurozone is low, and also significantly lower than in other regions. This is reflected in the spread level of Eurozone high yield bonds. So bond investors haven’t lost their minds? Well, I wouldn’t go that far. While there are sound reasons that help explain the current spread level against the 10-year German government bond yield, the total amount of yield you receive remains extremely low. The buffer against deteriorating market circumstances is slim. 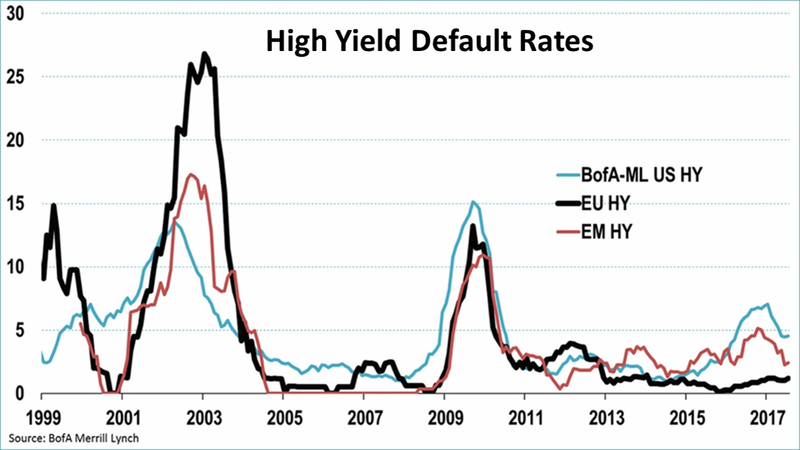 Any rise in government bond yields, or the number of defaults, will push the return on Eurozone high yield bonds to, or even below, zero. All is relative, however. A reduction, or ending of, the massive stimulus by the ECB, makes the outlook for Eurozone government bonds much more precarious. ← Have we seen peak EUR?